On November 2nd, Norm Pearlstine (LinkedIn) penned a missive to "Photographers Who Work with Time Inc." where he harkened back to the roaring 20's and the origins of Time and Life magazines (NYSE: TWX), and mentioned the "power of iconic photography" and suggested that "our commitment to original photography is as true today as ever", yet what Norm fails to recognize, in the new Time contract he's proffering, detailed and analyzed below, is that Time has NOT factored in any kind of cost-of-living into what Time is paying their photographers, and is trampling on the rights of photographers like a 20's flapper stomping on the dance floor. Perhaps they should remember that it's the talents of these photographers to create striking visuals that boost single-copy sales, and the talents of writers, reporters, and photographers, to create compelling content that readers will want to consume. This contract fails at facilitating a living wage. First, check out this Bureau of Labor Statistics calculator (here) and you'll see that to have the same buying power in 2015 as $1.00 in 1925, you'd need $13.60. So, has Time increased their assignment rates 13X since then? Let's start with 1980 rates. Going back to 1980, and adjusting for inflation their rates should be over $1,000 for what used to be a $350 assignment back in 1980. Exhibit A in the contract shows a 2015 rate of $650. 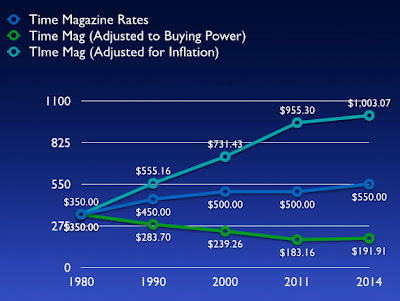 That means, that what you were earning at $350 in 1980 only gives you $191 in buying power today. We wrote about this extensively in December of 2014 - The Pathetic and Paltry Time Magazine Assignment Rate & Rights Grabs (12/31/14). I would love to find out what Time paid as an assignment in 1925 and plug it into the same calculator, because if they paid even $100.00 for an assignment in 1925 the same assignment would be $1,359 today. So, to reverse the equation, $650 in 2015 means that an assignment rate of $225 in 1980 was fair, and just shy of $48 an assignment in 1925. In neither case was it fair, and in 1980 they paid much more than that. "On behalf of Time Inc. and each Time Inc. division, affiliate, subsidiary, brand, and publication, this letter constitutes notice of termination of each Prior Agreement, effective as of January 1, 2016. All rights to photography you created under previous agreements between you and Time Inc., or any Time Inc. division, affiliate, subsidiary, brand, or publication, will continue to be governed by those agreements." So, what does the new contract dictate? This agreement (“Agreement”) is made and entered into as of January 1, 2016 (the “Effective Date”), by and between Time Inc., including its affiliates, subsidiaries, and divisions (each, a “Publisher Brand”), including editorial publications published, managed and/or operated by Time Inc. for third parties (unless such publications send you a separate agreement), and __________________ ("you"). Collectively, Time Inc. and Publisher Brands are referred to in this Agreement as “Publisher.” This Agreement governs the rights and obligations of Publisher and you with respect to Photographs and Videos you create in connection with each Assignment (as defined in Section 1) after the Effective Date of the Agreement, but not any photographs, videos, or other content you created or submitted to Time Inc. or any of its affiliates, divisions, or subsidiaries under any prior agreements. Rights granted by you are specified in Sections 3 and 4 and payments to be made to you are described in Section 6. Your performance of any Assignment or submission of any Photographs and Videos constitutes your acceptance of this Agreement. The above is standard boilerplate. Nothing wrong with that.Keep in mind here, all video you produce, and make no mistake about it, all smart phone photos you produce, are also governed by this agreement. Just because you used your professional cameras for much of the assignment, if you are using a different camera that happens to be a smart phone too, all the content you shoot with that device is also governed by this agreement. 1. Assignments. This Agreement will commence on the Effective Date and will continue unless and until terminated as provided in Section 16 (the “Term”). Each Publisher Brand based in the United States (an "Assigning Brand") may engage you from time to time during the Term to create for, and deliver to, the Assigning Brand: (i) photographs, including outtakes if requested, suitable for the Assigning Brand (each, a "Photograph") and, if also requested and agreed, (ii) video, motion pictures, and audiovisual works, including outtakes, suitable for the Assigning Brand (each, a “Video”). The Assigning Brand will communicate to you, before the applicable shoot, in an email or other writing, the Photograph/Video subject(s), due date, photo shoot expense budget, and other information relating to the particular project (the “Assignment”). Publisher Brands retain sole discretion over whether and when to use, and authorize the use of, the Photographs and Videos. Now it starts to get murky. "Assigning Brand" isn't defined. It may be obvious where they are saying related brands could be for Time and Time for Kids, or People and People en Espagnol, but what about Golf Magazine and Money and Fortune? Consequently you really don't know what rights you are assigning away to whom, or from whom you can expect to receive reuse payments under the "Affiliated Brands" schedule.Throughout this contract, video is referred to, and it should be noted that these could be full on productions requiring an entirely separate crew, or a simpler behind-the-scenes video of the shoot. Make certain you're estimating a completely different fee set for also being the producer of those videos. 2. Delivery. You shall deliver to the Assigning Brand all Photographs and Videos created pursuant to each Assignment, as specified in the Assignment or otherwise requested by the Assigning Brand editor, whether in the form of original transparencies, negatives, contact prints, high resolution, low resolution, digital media, video, audio-visual, computer generated work, or any other format now known or hereafter developed, no later than the due date set forth in the applicable Assignment, time being of the essence, or after such due date if requested at any time by the Assigning Brand. This requires you to deliver all your raw files (stills and video) on request. Be sure to allocate extra DAYS for the FTP time on this. 3. Rights Granted. You reserve and retain all rights in and to the Photographs (excluding the Idea House Assignments, as defined in Section 4) that are not specifically granted to Publisher under this Agreement, including ownership of the copyright. You hereby license to Publisher, the Rights (as defined below) to each Photograph created pursuant to an Assignment (excluding the Idea House Assignments), exclusively to the extent specified in Section 5 (Embargo). “Rights” means, collectively, the Assigning Brand Use & Reuse Rights, the Affiliated Brand Use & Reuse Rights, the Syndication Rights for Sports Illustrated, and the Time Inc. Photo & Food Studio Rights, each as defined below, each and all including the rights to reproduce, distribute, publish, publicly perform, display, download, transmit, and store the Photographs, and authorize and license the exercise of such rights to and by third parties, each and all throughout the world, in perpetuity, in any and all media, formats and methods of transmission now known or hereafter developed. Rights in accordance with its respective customary practices. (b) “Affiliated Brand Use & Reuse Rights” means the rights for any and all Publisher Brands except the Assigning Brand (the “Affiliated Brands”), to exercise the Assigning Brand Use & Reuse Rights as if each such Affiliated Brand were the Assigning Brand. (c) “Syndication Rights” means the rights for the Assigning Brand, only if the Assigning Brand is Sports Illustrated, to sublicense to third parties the exclusive right to license the Photographs directly and through sub-agents, including Getty Images, for editorial and commercial use by third parties. (d) “Time Inc. Photo & Food Studio Rights” means the rights for Publisher to use and reuse, and authorize and license the use and reuse of, for any purpose, Photographs created by you in the Time Inc. Photo Studio, the Time Inc. Food Studios, The Drive studio, or any other studio operated by Time Inc. or on premises owned or leased by Time Inc. (individually and collectively, the “Time Inc. Photo & Food Studios”) and commissioned in Assignments by the applicable Time Inc. Photo & Food Studios (and not another Assigning Brand) (the “Time Inc. Photo & Food Studio Photographs”); and Editing Rights and Crediting Rights for the Time Inc. Photo & Food Studio Photographs. It's sad that they try to say "You reserve and retain all rights in and to the Photographs...that are not specifically granted to Publisher" but then effectively take all the rights, leaving little to nothing for you to "reserve and retain." Typical trick. Don't fall for it. Additionally, there are no additional fees for space payments (except cover/cover insets) for Assigning Brand assignments outlined in the rate card, Exhibit A. Therefore presumedly there will be no space rates paid for any usage (except a cover) whether on first use or for any future use. So you've lost re-use there. This mean that Affiliated brands (i.e. other Time Inc brands/titles that are not under the umbrella of the assigning brand) can use images created on an assignment as if they were assignments from them and thus this would seem to be at odds with 6(a)(iv) which stipulates that some kind of payment will be made for such new use by affiliated brands. 4. Videos & Idea House Projects. With respect to any and all “Idea House Assignments” (defined as Photographs or Videos taken of or in connection with an Idea House project in connection with any Assigning Brand), and any and all Videos (as defined in Section 1), created by you in connection with any Assignment for Photographs, you hereby acknowledge that each Idea House Assignment or Video you create will be the sole and exclusive property of the Assigning Brand as a “work made for hire” within the meaning of the United States copyright laws, unless this would render you an employee of Publisher for purposes of an applicable unemployment insurance or workers’ compensation law, in which case each Idea House Assignment or Video will not constitute a work made for hire. If for this or any other reason each Idea House Assignment or Video does not constitute a work made for hire, you hereby transfer and assign all right and title, including copyright, in and to each Idea House Assignment or Video to the Assigning Brand. You also grant Crediting Rights to the Idea House Assignments and Videos to the Assigning Brand. ANY video you shoot while on a Time Inc. assignment is a work made for hire. ANY photographs you shoot when on an “Idea House Assignment” are works made for hire. This clause should be struck. Why does Time/et al need a WMFH? They don't. 5. Embargo. “Embargo/Exclusivity Period” means, with respect to Rights granted in Section 3 to Photographs, the period beginning on the date of the Assignment and ending on a date that is 90 days after the date of first publication by the Assigning Brand in the United States of any one or more of the Photographs created under the Assignment, or 180 days for Time Inc. Photo & Food Studio Photographs, or any longer period of time specified in any Assignment. Unless and to the extent you have the prior written authorization of the Assigning Brand, as applicable, you will not exercise, or grant to any third party for exercise, during the Embargo/Exclusivity Period, any rights throughout the world in any and all media, formats and methods of transmission now known or hereafter developed (including any of the Rights), with respect to any Photographs in the Assignment. consideration directly attributable to such Self-Promotional Use. Using this language, if an assignment is never published, photographs will be embargoed forever and cannot be used for any other purpose. Many photographers accept an assignment knowing there will be re-use revenue down the line. Further, you cannot use any images on your personal website, Twitter, Instagram, Facebook, or any other social media, promotional materials during the embargo/exclusivity period. See above about unpublished images. This also section makes mention only of the use of cover photographs after the 90-day embargo period without prior written authorization. It makes no mention of the possibility of using any other images generated on assignment for such purpose. Why the omission? Further, an image made with, say, a smart phone could be deemed to be a part of the assignment, so a photographer who instragramed out a photo would be in breach of this clause. So, for example, those photographers on the campaign trail in 2015/2016 had better have expressed written permission to be tweeting, instragramming, and facebooking photos from the assignment. It's unreasonable for this to apply to only a cover or cover inset fee. (vi) only if an Idea House Assignment fee or a Video fee is negotiated and agreed, an Idea House Assignment Fee or a Video Fee. you may email coupa.supplierenrollment@timeinc.com or the Coupa Supplier Help Desk at tiap_coupa@timeinc.com. As it relates to "1. All payments will be made only “after delivery and acceptance” of the photographs", In other words, if the photographs are rejected as insufficient or lacking (a purely subjective exercise), or if a story gets cancelled and the images are no longer needed before photographer has a chance to deliver them, Time Inc, is under no obligation to pay the photographer’s invoice. As it relates to "2.) All expenses must be pre-approved in writing. " There is NO way this is feasible. General expenses can be, but "all". Not a chance. Currently under the Coupa system (CNS), the options are for either a net 25 day net payment or a .5% discount on a net 10 day payment. Why the change to net 60? This isn't fair given that every other expense a photographer has is a 30 day expense. This contract calls for photographers to carry interest expenses on credit card charges, for example, until the next billing cycle. 7. Photo/Video Subjects. As between you and Publisher, Publisher will be responsible for clearing all rights and permissions (excluding copyright) required by any other people or entities (e.g., Photo/Video Subjects, sports leagues or conferences) for Publisher’s exercise of any of the Rights granted by you to Publisher, provided that you have fully informed the Assigning Brand in writing of any requested or asserted restrictions as specified in Section 7 (a). “Photo/Video Subject”), any employer, agent, manager or representative of any such Photo/Video Subject (“Photo/Video Subject Representatives”), any sports leagues or conferences, or any other person or entity. You will inform the Assigning Brand Photo Editor in writing (email is sufficient) of any such request or demand. (b) Notwithstanding Section 7 (a), upon request of the Assigning Brand Photo Editor, you will request from all Photo/Video Subjects, owners of locations pictured in the Photographs and Videos, and any other third parties, releases in a form supplied or approved by the Assigning Brand, and you will provide to Assigning Brand any signed releases you receive. In addition, if you deliver any Video including any music, you will make reasonable efforts to inform the Assigning Brand Photo Editor of all relevant contact information for music rights clearance. 7b is a problem, because, for example, it then prohibits any Sports Illustrated contributor from signing any agreement to get a photographer's vest on a football sideline or other similar "sign this or you don't get access" credential authorization. It also requires you to have what amounts to an entire "rights and clearances" team securing releases from everyone and anyone, including property owners. Oh, and if there's any music in your videos, you're responsible for clearing all that too. 8. Captions. You will give the Assigning Brand written descriptive information relating to each of the Photographs and Videos sufficient to enable the Publisher to write captions and video descriptions, and upon request and where available to you, documentation verifying the descriptive information. You agree to cooperate with Publisher and its employees, editors, researchers, agents, and legal counsel in connection with any editorial or legal review before or after publication of any of the Photographs and Videos. This makes sense, however, you could be required to caption each and every photograph. That'll be a lot of time if you're shooting for SI and deliver 6,000 raw files from one game. (d) You will comply with all applicable laws, rules, and regulations in performing the Assignment and creating and delivering the Photographs and Videos. Clause 9a means that you have to get WMFH contracts from all your assistants who might trigger a remote camera for you, for example. 9b creates problems where you are proving you have all rights to the content, so music in videos, or trademarks in still photographs, while not likely to be an issue, could well be here. 10. Editorial Guidelines. You agree that you will perform the Assignment and create and prepare the Photographs and Videos in compliance with the Time Inc. Editorial Guidelines, which can be found at http://www.timeinc.com/wpcontent/uploads/2014/04/editorial_guidelines_2012.pdf, and any updates by Publisher from time to time upon written notice to you. 11. Loss/Damage/Limitation of Liability. You acknowledge and agree that Publisher is not liable for any loss of or damage to the Photographs at any time, except to the extent caused by Publisher’s gross negligence, in which event Publisher’s maximum total liability is $1,500 per Assignment. Publisher may retain digital images of the Photographs to exercise the Rights, and Publisher has no obligation to return disks (or any other media) or digital copies. Notwithstanding anything to the contrary expressed or implied herein, in no event will Publisher be liable for consequential, incidental, exemplary, special or punitive damages, or lost profits, even if it has been informed of their possible existence. Normal but not fair unless there is parity for you. privileges or to any benefit, welfare plan or other employee plans or perquisites, including but not limited to pension, welfare benefits, vacation or termination pay, provided by, or on behalf of, the Publisher to its employees. You will be solely responsible for payment and withholding of all income, employment and other taxes. Normal. They don't want you claiming you're an employee when you're not. Information to your employees, agents, and subcontractors (“Photographer Agents”) only to the extent necessary to enable you to fulfill your obligations under this Agreement and for any Assignment, provided that Photographer Agents agree to keep confidential, and not to disclose to third parties, the Confidential Information. Without prior written approval of Assigning Brand (e.g., by email), you will not permit any third parties, including but not limited to Photo/Video Subject and Photo/Video Subject Representatives, to view Photographs or Videos prior to publication. Make sure you don't shoot images with a smart phone that embeds GPS data in images you send, or you'll be disclosing the location of where you were photographing the assignment. Otherwise, this is pretty standard. Agreement or assign, subcontract, or license any or all of your rights or obligations hereunder without Publisher’s prior written approval (e.g., by email), which may be withheld in Publisher’s sole discretion. This makes sense and is fair. However, keep in mind, If Time Inc sells a title or brand to a third party, all the usage rights herein are automatically transferred to the new owner. ALL OF THEM. improper venue or inconvenient forum. Publisher and you also acknowledge and agree that neither will seek to litigate any claims against the other on a class action or representative party basis and that each shall pursue any claims solely on an individual basis. This Agreement constitutes the complete understanding and agreement of you and Publisher with respect to Assignments to you after the Effective Date and supersedes any and all prior or contemporaneous written or oral agreements between you and any Publisher Brand with respect to such Assignments. Prior agreements between Publisher Brands and you relating to any prior assignments will continue to govern those prior assignments. injunctive or otherwise, with respect to any rights in any Photograph or Video or any grant to or exercise by Publisher of any of the Rights. Electronic and facsimile signatures will have the same force and effect as original and handwritten signatures. While Time may want the Agreement to be governed by New York law, and honestly, it does make some sense, if you're doing the assignment in another state or country, and your business is also in another state or country, this clause ensures the contract will be governed by NY law. Keep in mind, NY law is pretty favorable to the publishing industry. It's laughable that they would expand and arguably re-define the word "including" to also mean "without limitation". Also, keep in mind that "Handwritten comments added to this Agreement will have no force or effect" so don't think you can line-out and hand-notate changes, they don't count. 16. Termination. This Agreement may be terminated by either you or Publisher for any reason or no reason, effective thirty (30) days after written notice (the “Term”). Termination of this Agreement will not terminate any grant of rights or copyright transfer made herein with respect to the Photographs and Videos that were created on Assignment while this Agreement was in effect. After any termination, Publisher retains and will continue to have the right to exercise the Rights, and the obligations of Publisher will remain in effect, with respect to the Photographs and Videos that were created on Assignment while this Agreement was in effect. Sections 3 – 7, 9, and 11-17 will survive any expiration or termination of this Agreement with respect to the Photographs and Videos that were created on Assignment while this Agreement was in effect. The above is a standard clause. 17. Notice. All notices and other communications under this Agreement shall be: (i) in writing; (ii) delivered by email, to Time Inc. at Digital_Asset_Contracts@timeinc.com and to you, at the email address at which you received this Agreement; and (iii) effective the first business day after the date of emailing. You and Time Inc. may provide written notice to each other of any new email address by written notice in accordance with this Section. The above notice is required, and which also is the reason that photographers are getting a November 2 2015 notice, as it's 60 days prior to January 1, more than enough time to terminate existing contracts. Assigning Brand Fees will apply. 2 For People, the foreign licensed edition in Australia & New Zealand is Who Weekly. 3 For purposes of this agreement, Affluent Media Group includes Food & Wine and Travel + Leisure. This is a horrible contract and is unfair to photographers. There are other egregious terms, and after awhile there are so many that the entire contract needs to be re-written with fairness to both parties. It comes across as non-negotiable, and likely will not be negotiable unless a majority of photographers stand up and say no to this deal. Back in the day, the collective Editorial Photographers group (http://www.editorialphoto.com) would be stepping in and re-negotiating this contract like they did with Fortune, Business Week, and others, with much success. EP is now a part of APA, American Photographic Artists. Perhaps the old EP can re-engage on this? Feel free to email Norm at his personal email address, which I found here on his website, at norm@normanpearlstine.com and let him know how horrible he is treating those who make people want to buy and read his publications.